My dad Randy Hutchins was a commercial fisherman in Alaska for many years. 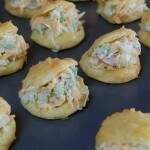 His friend Betty would make these crab filled puffs for the fisherman in exchange for free King crab, what a delicious treat!! Preheat oven to 400 degrees. Line a large baking sheet with parchment paper; set aside. CHEESE PUFFS: In a large pot, bring water, salt and butter to a boil; add flour, stirring quickly with a heavy wooden spoon to form a ball. Take off the heat and add eggs one at a time, beating each one separately by hand. Stir in Swiss cheese, beat by hand until combined. Drop cheese puff mixture by the teaspoonful onto the prepared baking sheet. Bake for 25-30 minutes. Cool 2-3 minutes. Using a serrated knife, gently slice each puff in half, leaving a hinge, being careful not to cut all the way through. CRAB FILLING: In a large bowl, gently stir crab filling ingredients together until combined. 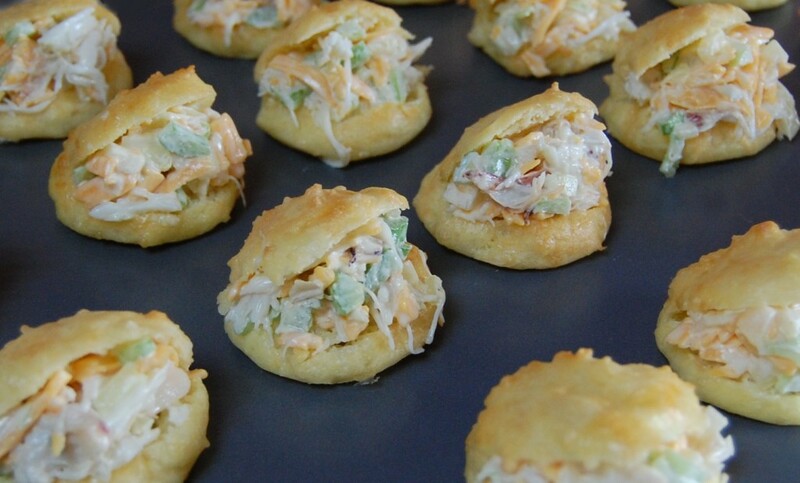 Fill each cheese puff with crab filling. Serve hot or cold.